The object of the competition is to design a vehicle that will roll down an inclined surface into a flat surface disturbing the payload. The payload will be a medium size egg. It must sit in a container of a specific dimension. Only the container and the egg must stay on the vehicle after it comes to rest. The incline of the surface will be increased until no vehicle can travel it safely. The vehicle that can safely transport the egg farthest at the steepest incline will be the winner. a) The vehicle may be any weight. Height, width, length must be no bigger than 10 cm. b) The pay load container must be made out of recyclable materials aluminum, paper, cardboard, etc. and must have an dimensions not bigger than (4x4x6) cm. c) Types of adhesive allowed for the construction of the container and the vehicle: liquid glue, hot glue, adhesive tape. d) The vehicle and container must be built so that nothing can possibly touch the egg except the inside wall of the container. e) The only energy that can be used is the potential energy from the vehicle being at the top of the incline. No other energy can be applied to the vehicle. f) Only the vehicle itself can touch the incline. a) The payload is a raw white medium size egg at any grocery store. b) Nothing can be applied to the egg such as glue. c) The thickness of the shell of the egg has no specifications since it is not necessary for the egg to crack for a vehicle to be disqualified. d) At the beginning of the competition, each “engineer” will have the choice of one egg from a group of twelve official eggs. These eggs will be marked and are the only eggs that can be used during the competition. They will be inspected by the judges prior to the competition so that no egg will have more desirable features over others. Should any “engineer” need another egg, they will be allowed to choose again. No group can have more than one uncracked official egg at one time. Mục đích của cuộc thi là thiết kế một chiếc “xe”. Chiếc xe đó sẽ lăn trên một bề mặt nghiêng xuốn sàn nhà và không làm bể “hàng”. Hàng phải chở là một quả trứng. Hàng phải được đặt trong “thùng” (container) có kích cỡ nhất định. Không có gì khác có thể chạm vào trứng, thùng đựng và trứng phải còn trên xe khi xe đã ngừng. Độ nghiêng của bề mặt sẽ được tăng dần lên cho đến khi không chiếc xe có thể lăn xuống một cách an toàn. Chiếc xe lăn xuống dốc an toàn và chở trứng đi xa nhất sẽ là xe đoạt giải. Chiếc xe có thể nặng nhẹ tuỳ ý. Chiều cao, dài và rộng không lớn hơn 10 cm. “Thùng” đựng trứng làm bằng giấy (carton) hay aluminum hoặc những chất liệu dùng lại được (recyclable materials) và phải có đường kính chiệu dài, rộng không quá 4cm và chiều cao không quá 6 cm. Chất dính được phép dùng để làm “thùng”: keo nước (liquid glue), keo nóng (hot glue), hay keo dính. Chiếc xe và thùng phải được chế tạo để không có gì có thể có thể chạm vào trứng ngoại trừ thùng đựng trứng. Xe di chuyển bằng độ dốc (thế năng/potential energy) và không dùng năng lược nào khác. Chỉ có xe được chạm mặt phẳng nghiêng khi di chuyển. “Hàng” phải chở là 1 quả trứng (trắng) cỡ trung bình có bán tại siêu thị. Quả trứng để nguyên, không sơn, vễ hay bôi keo dính. Độ dầy của vỏ trứng không quan trọng vì vỏ trứng dù không nứt/bể xe vẫn có thể bị loại vì những lý do khác. Trước khi bắt đầu cuộc đua xe, mỗi “kỹ sư” sẽ được chọn 1 quả trứng trong 1 hộp trứng do ban giám khảo cung cấp. Những quả trứng này đã được ghi số trước và là những “hàng hoá” duy nhất được dùng trong cuộc thi đua. Tất cả trứng dùng trong cuộc thi đã được ban giám khảo kiểm nhận không có những tính chất khác nhau. Khi cần quả trứng khác, “kỹ sư” dự thi sẽ được ban giám khả cho chọn 1 quả khác. Không thí sinh nào có quyền có 2 quả trứng cùng lúc trong suốt cuộc thi. There are 3 different vehicle designs, 5 vehicles, in this car race. The first, type 1, is a vehicle that uses two cylinders joined together by a thin piece of tape. The container is made of cardboard of insignificant mass. There was no merchandise on this car. (Note: This vehicle was in the race but not in the competition; another vehicle also raced but not in the competition was the Yellow-Purple Type 2 vehicle). 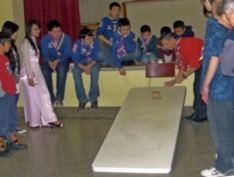 The incline is a plastic table 30” (76 cm) wide and 96” ( 244 cm) long standing on one side with 2 heights, 40 cm ant maximum height of about 30” (76 cm). Type 1 vehicle weights approximately 110 grams; similarly, type 2 vehicles weight about 115 grams. 1. The principle of conservation of energy, states that energy can be transformed (changed from one form to another), but cannot be created or destroyed. 2. PE transforms into KE (Rotational) where PE is the vehicle potential energy (at the top of the incline, the vehicle was at rest, KE = zero) and KE is its Kinetic Energy at the end of the incline, here PE = zero. With this KE the vehicle could roll on for ever; yet they did stop at a certain distance. Why? This is a type 2 vehicle. It is undecorated; the egg container was made with plain paper. The merchandise stays on one side of the vehicle. Travelling distance was bout ½ of the hall length (30'9"). This is also a type 2 vehicle decorated with aluminum foil. The designer used plastic dringking straw to further decorate his design. These straws were indeed also serves as the merchandise’s container. This vehicle travelled 1/3 of the length of the hall (20'3"). Relatively speaking, the free movement of the merchandise (versus William’s) while travelling did reduce its travelling distance. Nhật Tân’s vehicle: This type 1 vehicle used two cylinder joined together by a thin piece of tape. The container is made of cardboard of insignificant mass. There was no merchandise on this car. This was the reason that it was not placed in the competition. It was practically an undecorated empty thin-wall ring (9 cm wide and 9 cm high), weighing 110 grams. It travelled the longest distance (the whole length of the hall, 61'6") in almost a straight line. There was not a single broken egg for the whole course of the race! Other paticipants - Ạn, Khương, Eric - whose vehicles were not present at the race for various reason (eaten by dog, burnt off by a friend, or simply being forgotten) got consolation acknowledgment. The second design, type 2, is mainly one cardboard cylinder with varying type of containers (of insignificant mass) and an egg of 60 grams as its merchandise. The third design is the cardboard cylinder (actually it was a roll of masking tape) on its side on top of a plastic platform of a toy car. This design was not successful in carrying its merchandise far from the end of the incline. Its mechanics will not be discussed in details. 4. The second factor that influences the travelling distance of the vehicle is its stability while in motion. Therefore, friction would not influence the vehicle travelling distance that much. What left was the stability of the vehicle while rolling down the incline and rolling on the flat floor. This “type 3” vehicle was made of a cardboard cylinder (actually it was a roll of masking tape) on its side on top of a plastic platform of a toy car. It was the most decorated vehicle. 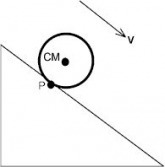 However due to first, its instability (omnidirectional while rolling down the incline); second, its too small wheels were unable to sustain the impact at the end of the incline making it stop not very far from the incline. In short, most of its PE was lost (transformed into heat, thermal energy) due to its erratic travelling path down the incline. Troop scouter’s vehicle: This one closely represents type 2 vehicle. It was made with one cardboard cylinder of 4.5 cm wide and 9 cm high. The container was indeed a portion of real egg container. To reduce shock, the designer used polyethylene foam (a recyclable material) to cap the merchandise rendering it stationary in side the vehicle. A distinct difference of this vehicle with the other is its contact area with the surface: two thin cardboard rings of 0.5 cm wide were glued to the sides of the main card board cylinder. This group colors decorated vehicle weighs 115 grams and travelled almost the whole length of the hall; yet its travelling distance was not a straight line. Lack of stability is the cause.